More than just a home away from home. We take your vacation experience seriously so you can be assured that Mais Oui villa and staff will be ready and as advertised when you all arrive. From our beginning, we wanted to share the island's vibrant culture in a setting that offered amenities rivaling that of a five star resort or hotel, but without the same cookie-cutter approach. We created Mais Oui as a vacation rental in Jamaica that guests look forward to with giddy anticipation because we are sincere and committed to providing an exceptional, elegant introduction to the beautiful island and its' people. You can see this is reflected in our reviews! Imagine your own private, beach-adjacent Jamaica villa that's central to more than 30 Jamaican adventures. When you walk through our 8-bedroom villa and you'll see an exhibit of local artwork from area artists, furniture created by Jamaican craftspeople, and views of the historic Rio Bueno Harbor. The sights, sounds and delectable smells of your Jamaica vacation will be a reality as you savor every hour of your stay! Mais Oui Tennis and Spa Villa is fully licensed by the Jamaica Tourist Board! Picture yourselves having a game-night in one of our three indoor living areas, or even a fabulous movie-night on our terrace theater under the stars! Kids, parents and grandparents alike enjoying themselves splashing around the swimming pool. Shooting some hoops or hitting the private tennis court for competitive family fun! Foosball, ping pong and billiards await! Just imagine, our local staff are your personal tour guides to all Jamaica has to offer. From culinary thrills to seeing the sights in comfort and safety, on and off the beaten track! No need to stress about a rental car or fumble with a map or GPS to experience the best of Jamaica with us! Please note - when available Christmas week is December 19th - 26 and New Year's week is December 27th through January 3rd. There is a little flexibility on dates but these are full week, full occupancy bookings only. "I had high expectations for our family vacation in Jamaica - and the staff at Mais Oui not only met every one of them but exceeded them beyond what I could have imagined. Thank you so much for treating my family like your family. Our experience here is one that I will treasure always." My wife and I built Mais Oui (pronounced 'May Wee') in 1999 and opened officially in 2000. We created Mais Oui to be more than a home away from home. It was designed to be super comfortable and well equipped so that guests would not miss the hotel experience … "Upscale but not uptight" as one guest puts it. As an independent property that has to compete not only with hotels but also gated planned communities with club memberships, we chose to provide a host of amenities that typically would not be available at a private home. Our previously silent partner, our son, is now growing up and has helped us realize new ways of involving and welcoming children in the Mais Oui vacation experience. One of our core values is to enhance the lives of the Jamaican people. One way we do that is through our commitment to our staff. We have up to about 12 people (depending on the number of guests), some full-time, some part-time, who work with us as a team, to make the Mais Oui experience a reality. We work very hard to have guests stay with us so that we can, in turn, afford to keep our staff employed thereby contributing positively to their lives and the local community. We're an 'ocean view' location because the Jamaican experience isn't only about the beach. That said, we are a mere 2-3 minute walk from the beach so we also provide that classic experience for our guests as well. Jamaica is so much more than "sun, sea, and sand" or "rum, rasta, reggae and reefer". Rather, it's also about the food and the people which also includes their culture and history. Mais Oui is designed to introduce visitors to the island with a taste of the "true Jamaica", in style and comfort. There's no need to pay a beachfront premium to enjoy these key elements of the island! All 6 bedrooms in the main villa have full en-suite baths - 2 have whirlpool tubs, the other 4 have either regular or soaking tubs. The 2BR suite, the Papaya Loft, has one bathroom which is a full bathroom with a tub/shower. Mais Oui is a 2 to 3 minute leisurely walk to the nearest beach. A house phone is provided for guests to make local calls. Each of the 8 bedrooms are air-conditioned and also have ceiling fans. On-site parking within gated location! The villa provides basic internet suitable for informational web sites and checking email. Does not support streaming. Multiple terraces from which to view the sea! Limited Snorkeling equipment and kayaks available. Persons may get around in a wheel chair on the first floor with assistance but the living room and main dining room are "sunken" with multiple steps to access them. No wheel-chair accessible ramps are available any where through out the villa. The Villa is beautiful and the staff was amazing. Dillion, Fernando and Audrey made sure we were comfortable and Chef Gavin and Perry amazed us at every meal. Ms Pet was a pleasure the entire staff was extremely attentive and made sure that our special day was memorable. We encourage anyone that can to choose this villa you want be sorry. Best vacation ever. is 6 stars an option? Mais Oui was absolutely incredible. Immaculate gardens, safe, secure, private property, amazing made-to-order food, friendly, considerate, in-house staff, very clean, large private pool. The staff took great care to make sure that we felt welcomed, safe, entertained, and comfortable, even accompanying us on off-site excursions. The complimentary beach club just up the road was a lot of fun and also safe, secure, and entertaining. We hope to be back soon. Family friendly (we brought a baby). This villa is beautiful and the staff are wonderful and personable. We had an amazing time celebrating our parents 50th wedding anniversary with 4 families. The villa is so spacious that everyone can spread out and do whatever they wish. Highly recommend! One of the major benefits to running our vacation rental is the ability to meet such wonderful fun-loving people who enjoy Jamaica! Our staff aims high intending to provide the most enjoyable Jamaican vacation experiences for everyone. It is truly heart-warming to see that so many people recognize the 5-star service we constantly strive to deliver! I highly recommend this one of a kind villa that caters to all ages. The garden was very soothing and filled with beautiful flowers, plants, and fruits; the garden is labeled so it’s easy to identify the trees, plants, herbs, etc. the Chef utilizes the produce from the garden in the meals as well. The pool table was a hit for my family and the swimming pool was used every day. The staff keeps the villa and grounds extremely clean, decorated with fresh flowers, towel decorations as well. Bar, surround sound music, games for kids and adults, spa, outdoor shower and tub, movie theatre outside, private beach area with kayaks, staff that caters to your every need. There is really no need to leave the villa, they have everything imaginable to cater to ALL! The beds are very comfortable and set up to accommodate large families or single occupants per room. 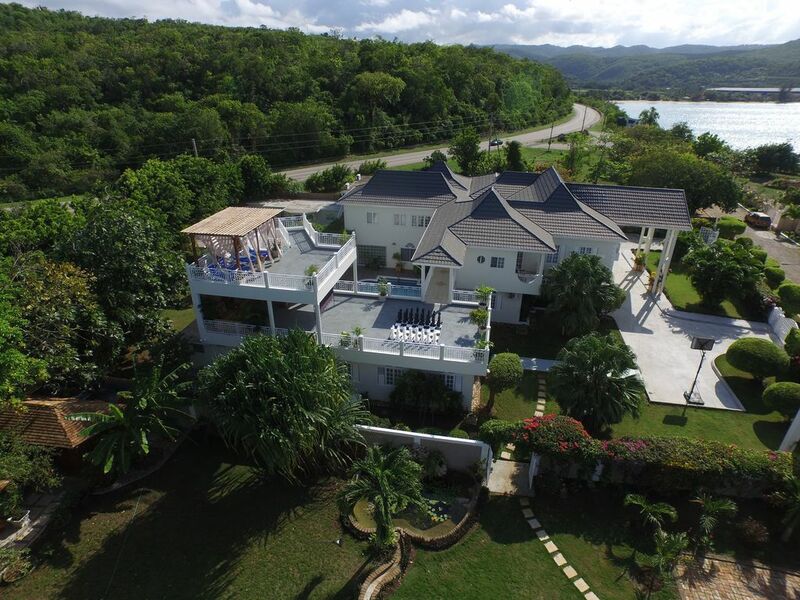 Best Villa in Jamaica! Truly it is wonderful to match up our location and amenities to such great guests who appreciate and enjoy what we have to offer here at Mais Oui. Our goal is to provide a consistent 5 star experience from beginning to end! I am the type of person who is able to find beauty in almost anything and as a result I am generally not easily blown-away or impressed BUT from the first moment of being greeted at the airport, I knew that this was going to be an extraordinary vacation. Upon arrival at the Villa, it was 1st Class, Top Shelf until our departure. The staff was extremely professional, friendly, accommodating and left nothing undone. The chef was AMAZING; the Villa is beautiful, comfortable and offers every amenity you could want; the spa experience was heavenly; the grounds are immaculate; and security was top notch. Truly a "No Worries Mon" vacation. I highly recommend Mais Oui Spa & Villa. The owners and staff at Mais Oui Tennis and Spa Villa are truly grateful for our wonderful guests allowing us the opportunity to share the beauty of the island with them. Our goal is always to meet and exceed expectations and we thank you all for having chosen to stay with us! - Under an hour's drive from airport ... compared to 1.5hrs drive for people staying in Ocho Rios or Negril. - Convenient base from which to see the island ... Within an hour from leaving Montego Bay, you will arrive at Mais Oui. Drive another 30-35 minutes and you are in Ocho Rios. This central location makes sightseeing choices more accessible and enjoyable. - Close to a host of other activities ... 30 attractions are within a 30 minute drive of the villa ... additional snorkeling and scuba diving sites, golf courses, horseback riding stables, tennis courts, water-sports, shopping, night-life, historic sites, and almost anything else your heart desires! Rates based on double occupancy head count of 6 people. Lower rates apply to smaller groups. Additional per person per night applies to larger groups and is calculated by HomeAway site. Please note that when the quote says "additional guest fee" that is making reference to how the site calculates the rate (Base Rate for 6 persons + Nightly rate per person for persons 7 through how many) and is not a charge for "extra people". Mais Oui is rented to one group at a time. Un-rented bedrooms are locked off. All payments are to be in US dollars and are subject to 10% Jamaican tax. Staff gratuity, which covers staff overtime and their efforts to "go the extra mile" to contribute to your wonderful stay is not included in our rates. The standard in the industry is 10% in high season and 15% in low season. Christmas and New Year's weeks are full week full occupancy bookings only. How To Book The Villa An initial deposit of 25-30% of villa rental rate is required to book villa and hold your reservation. The remainder is due in full by 60 days prior to occupancy (90 days for Christmas and New Years). If you are booking a stay within 60 days of arrival, the full amount is due at the time of booking and would be nonrefundable per the rental agreement. Rates do not include meals. Budget $45 per person per day for meals. Generally 30% deposit to book villa. Remainder due in full by 60 days prior to occupancy. Payments made online and/or in absence of signed rental agreement constitute you agree with its terms as if signed. To get an accurate cost for your stay, enter the dates of your stay first, then be sure to enter the number of guests (adults and children over the age of 2 at the time of travel) that will be staying. We will review your information for accuracy before we accept your booking.